We would like to welcome everyone to the website of F.P.H.U DREWNOSTYLE – makers of English period furniture. If you have a reason for visiting our website, it means that you are looking for English period furniture of the highest quality. Our firm’s greatest asset is our team of professionals who specialise in English and Period furniture making and in the restoration of antiques. Our employees have been working in this field for over 25 years, and that is why we can offer our clients the highest quality of furniture making and great satisfaction from our services. Our existing clients can testify to that. 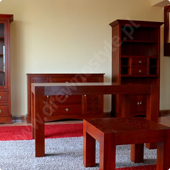 All our furniture and our services are covered by a quality Guarantee. Our furniture has received great reviews in Poland and in the whole of Europe – this is confirmed by numerous reference letters and positive commentaries on internet auction sites (such as allegro). Our product range and services is directed to private clients, owners of manor houses, pension houses, castles, hotels, restaurants, inns, taverns, churches, abbeys, etc. 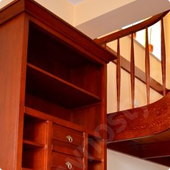 antique furniture, churches, abbeys, hotels, castle interiors, interiors of town houses, all wooden elements, etc. English furniture is made according to designs and our own ideas – items of furniture are stylised to have an antique look. Furniture of this type is the core of our firm’s activity. Items like libraries, desks, tables, etc. are sent to Holland and England. We are the only firm which makes furniture according to tradition and gives it an unusual English finish. 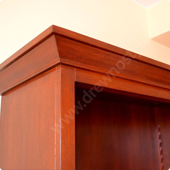 We are the only firm in Poland giving our furniture an English finish (our company’s secret method). The patent formula we use, as well as all the wood stains, varnishes and waxes are delivered directly from England. Furniture which is finished using this method is unique, it retains its charm, natural look and with time it increasingly gains an antique feel. 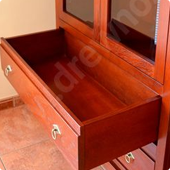 Our clients can also request their furniture to have the traditional shellac finish. 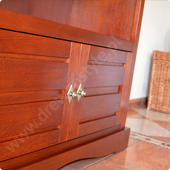 We are also makers of furniture of any type and we can reconstruct it from photographs, drawings and sketches. We give advice on appropriate furniture for specific interiors, offices, houses, studies, etc. Our firm accepts orders and carries out assignments throughout the whole of Poland. 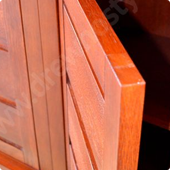 Only fine wood is used for our English and period furniture, such as: oak, mahogany, cherry, walnut, etc. This selection of materials gives our furniture a long life, an unparalleled look and character. Our Client chooses the materials from which furniture is to be made. We are always happy to provide advice, as we want to make sure that our furniture is functional and long-lasting. We can carry out any assignments, even ones which are impossible for other firms to complete. We give our Clients a free choice of dimensions, colours, ageing effects, materials and finishing methods, etc. We believe that our Clients should decide about their own furniture, as they are going to be the end users of the furniture we make. Of course, at every stage of a selection process we are there to help and advise on what can be useful to our Clients. We are guided by our knowledge and our many years of experience. Please feel free to get acquainted with the information and promotional offers presented on this website.